Millions of people are coping better with the hectic stresses of life by finding a new peace through the practice of meditation. Scientific studies are discovering that meditation can have profound health benefits such as easing chronic pain, anxiety, and stress, improving heart health, memory and cognitive functions, as well as boosting mood. For more information on the health benefits, visit the NIH website and/or this article in Psychology Today. Jennifer Garcia, Founder of Spiritual Spectra, was quoted on the importance of Meditation in an article in The Baltimore Sun entitled “Take Peaceful Journeys for Your Mind’s Health” on February 1, 2019. 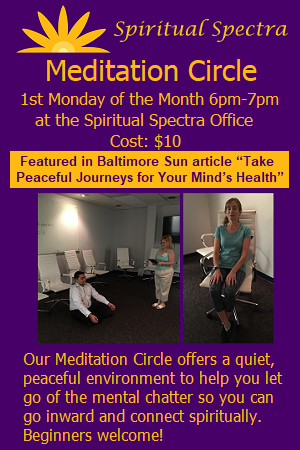 Spiritual Spectra offers a Meditation Workshop on an individual or group basis at our office in Columbia, Maryland for those who would like to learn how to meditate. The Meditation Workshop can be offered as one hour with basic instruction on various types of Meditation or two hours which also give practice on some of these types of Meditation. One hour is $100 and two hours is $200. For businesses with 3 or more employees we can come to your office at a cost of $350 for businesses in Central Maryland & Washington, D.C. (other locations might incur an additional travel fee). If interested in scheduling a private workshop or a workshop for your business or organization, please contact us! The Meditation Workshops we offer have no religious affiliation, all are welcome! Clients can choose to pay in advance by clicking the above link or on the day of the appointment. connect spiritually. Click here for more information.